Only 40% of middle-class college entrants who were high school seniors in 2004 had secured bachelor's degrees by 2012, according to the Department of Education. Here's a little-known, scary stat: More than half of middle class kids who start college fail to earn a bachelor's degree within six to eight years. The low graduation rate has big implications for young adults' ability to remain in the middle class, or to rise a few rungs above their parents on the economic ladder. A college degree, once a ticket to the middle class, is now a must-have to maintain that status. Why these kids aren't graduating with bachelor's degrees isn't really known. A lot of attention and effort is focused on getting lower-income children into and through college. But few researchers study the path of students from middle class families. "It's startling. We get people to college, but they don't finish," said Sandy Baum, a research professor at the George Washington University. "The middle class gets lost in the shuffle." The U.S. Department of Education tracks college graduation rates in two ways: It follows kids in the years after they graduate high school, and, separately, it tracks all Americans who enter college in a particular year. The department periodically checks back in with them for several years. Both stats found that fewer than half of middle class students were actually leaving with a bachelor's degree. Only 40% of college entrants who were high school seniors in 2004 and whose families earned between $46,000 and $99,000 had secured bachelor's degrees by 2012, according to the first measure. This compares to a graduation rate of 63% for those from the top of the income ladder, and 28% and 20% for moderate- and lower-income students, respectively. Similarly, the second measure, which looks at all dependent students who started college in 2003 from families with incomes between $60,000 and $92,000, found that only 45% had earned a bachelor's by 2009. 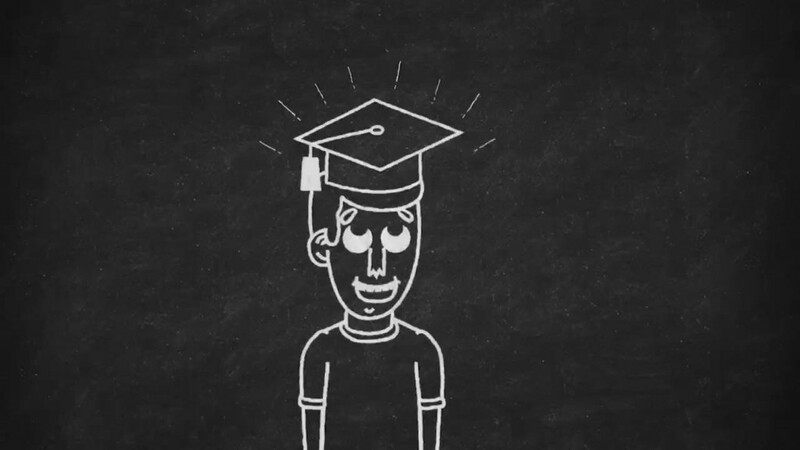 Share your story: Are you a middle class kid who dropped out of college? To be sure, some students take longer than eight years to earn their diplomas. But the longer they are in school, the less likely they are to graduate, Baum said. 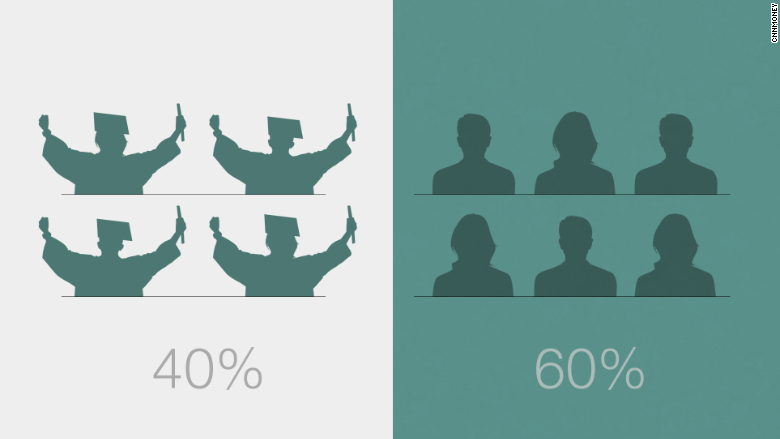 Full-time students are more likely to graduate with bachelor's degrees. For instance, some 63% of middle class students who entered college in 2003 and went full-time earned diplomas by 2009. The same is true of those who go to more selective colleges, which have higher graduation rates in general. But why are middle class students overall having such a hard time finishing school? These students face similar hurdles to graduation as all Americans, regardless of class, experts said. About one-third of middle class students who dropped out told the Education Department they left due to financial considerations, about the same rate as those from other income groups, said Nate Johnson, head of Postsecondary Analytics, a higher education research and consulting firm. About as many cited more amorphous "personal reasons." Also, many enter college unprepared academically, prompting some to quit because they can't keep up, experts said. Still, others don't have the perseverance needed to get through college. Some leave school with associate degrees or certificates. When you add these in, the graduation rate goes up to 62% for middle class kids, according to the first measure. Still, a bachelor's degree is considered the gold standard, said Anthony Carnevale, director of the Georgetown University Center on Education and the Workforce. Workers with a bachelor's degree will earn $2.3 million over their lifetime, on average. That's $600,000 more than someone with an associate's degree and $800,000 more than those who left college with no diploma. "It's a lot harder to maintain your middle class status without a degree," he said.